Miklós Boskovits (1935–2011), “Agnolo Gaddi/The Coronation of the Virgin with Six Angels/c. 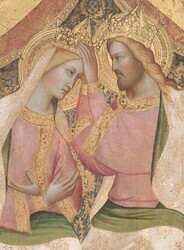 1390,” Italian Paintings of the Thirteenth and Fourteenth Centuries, NGA Online Editions, https://purl.org/nga/collection/artobject/344 (accessed April 21, 2019). The Coronation of the Virgin is the final episode in the story of Mary’s life. After her death, she ascended to heaven, body and soul, to be crowned queen by her son. Angels sang and played music in celebration. The subject of the Virgin’s coronation was especially popular in Florence during the last half of the 14th century. Often it appeared at the center of a tripartite altarpiece, flanked by crowded scenes of adoring saints on either side. Very likely, this painting was originally part of such an assemblage. The subject of Mary’s coronation—an appropriate place for the display of regal finery—complemented a late-Gothic renewal in contemporary Florentine painting. During the later 14th century, artists explored the expressive potential of curvilinear contours and richly decorated surfaces in combination with the naturalistic approach pioneered earlier by the Florentine artist Giotto (Florentine, c. 1265 - 1337). The father of Agnolo Gaddi (Florentine, c. 1350 - 1396), in whose shop the painter had trained, had been a disciple of Giotto. But here Agnolo has departed from Giotto’s heavier and simpler forms in favor of more slender and refined figures. Mary and Jesus appear on, rather than in the space they inhabit. Profuse patterns appear in the gold brocades of their robes and the rich cloth of honor behind them fills most of the picture plane, drawing our eyes to it. Where Giotto had given his figures a certain solemnity to match their physical weight, the faces of Agnolo’s figures exhibit a gentle elegance and sweetness. While Giotto’s composition prescribed the presence of far more numerous groups of saints to the sides of the Coronation depicted in the central panel, Florentine triptychs and polyptychs of the fourteenth century often show only two saints to the sides of the scene; cf. the polyptych by Puccio di Simone now divided between the museums of Ghent and Berlin, in Richard Offner, A Critical and Historical Corpus of Florentine Painting: The Fourteenth Century, sec. 3, vol. 5, Bernardo Daddi and His Circle, ed. Miklós Boskovits, Ada Labriola, and Martina Ingen­daay Rodio, new ed. (Florence, 2001), 421–429, or that by Giovanni di Tano Fei, dated 1394, now in the Metropolitan Museum of Art in New York, no. 50.229.2. 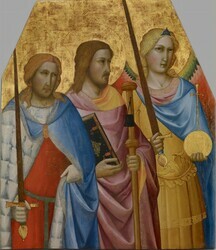 The Yale panel of Saints Julian, James, and Michael (no. 1871.20) measures 86.8 × 74.6 cm but has been slightly cropped along the sides and more substantially cut along the top and bottom; originally it must have measured between c. 110 and 130 cm in height, thus achieving dimensions that would be consistent with a triptych having the Washington Coronation at its center. The Yale panel is not easy to assess, however, given its present state of conservation. After a nineteenth-century restoration had completely regilded the heavily worn gold ground, including new halos with inscriptions bearing the names of the saints, the painting was subjected to a rather brutal cleaning in 1959, which stripped it of its previous additions and retouches and left visible a heavily abraded paint surface with all its lacunae. Cf. Charles Seymour, Early Italian Paintings in the Yale University Art Gallery (New Haven and London, 1970), 37–38. Cf. Miklós Boskovits, “Some Early Works of Agnolo Gaddi,” The Burlington Magazine 110 (1968): 210 n. 5; and Bruce Cole, Agnolo Gaddi (Oxford, 1977), 31. Despite such misgivings, some attempt to clarify the sequence of works produced in Gaddi’s bottega in the last years of his life will perhaps not be entirely futile. Erling S. Skaug, in Lorenzo Monaco: Dalla tradizione giottesca al Rinascimento, ed. Angelo Tartuferi and Daniela Parenti (Florence, 2006), 106–110; Erling S. Skaug, “Towards a Reconstruction of the Santa Maria degli Angeli Altarpiece of 1388: Agnolo Gaddi and Lorenzo Monaco?” Mitteilungen des Kunsthistorischen Institutes in Florenz 48 (2004): 245–257. as in the triptych in Washington (see Saint Andrew and Saint Benedict with the Archangel Gabriel [left panel]; Madonna and Child Enthroned with Twelve Angels, and with the Blessing Christ [middle panel]; Saint Bernard and Saint Catherine of Alexandria with the Virgin of the Annunciation [right panel]), the three music-making angels on the left side seem virtually mirror images of the group facing them on the opposite side — ​​in composition, pose, gesture, and details; the only variation is in the musical instruments in the hands of the pair of angels in the foreground. As it can be argued that the Berlin and Washington paintings are chronologically close, we can perhaps infer that this trait is characteristic of a moment in Gaddi’s career. The Coronation discussed here, however, differs from this scheme in various respects. Though the number of angels remains the same, their arrangement and pose differ, each reacting in a different way to the scene of the Coronation [fig. 2] [fig. 2] Detail of angels, Agnolo Gaddi, The Coronation of the Virgin with Six Angels, c. 1390, tempera on panel, National Gallery of Art, Washington, Samuel H. Kress Collection. Even their physique is different: their bodies are longer and more slender; the oval of their faces is more elongated; and their aristocratic features and ecstatic expressions are wholly attuned to and absorbed in the music they play. In comparison with the two above-cited triptychs, their garments, moreover, seem more simplified in design, their draperies less minutely ruffled than before; articulated with deep folds, they confer a certain grandeur on these secondary eyewitnesses of the scene. Miklós Boskovits, Pittura fiorentina alla vigilia del Rinascimento, 1370–1400 (Florence, 1975), 123–124; Bruce Cole, Agnolo Gaddi (Oxford, 1977), 51–56, 72, pls. 87–96; Angelo Tartuferi, “Le opere d’arte e la decorazione pittorica della chiesa,” in La Basilica di San Miniato al Monte a Firenze, ed. Francesco Gurrieri, Luciano Berti, and Claudio Leo­nardi (Florence, 1988), 1986. In contrast to most art historians, Cole did not believe that the documents of 1394–1396 referred to this work and considered it a product of Gaddi’s followers. The latter comparison is especially telling, since that altarpiece was begun in 1394 and probably completed only in the immediate aftermath of the artist’s death in 1396. On the neo-­Giottesque current in Florence that influenced many painters between the late fourteenth and early fifteenth century, cf. Miklós Boskovits, Pittura fiorentina alla vigilia del Rinascimento, 1370–1400 (Florence, 1975), 87–88, 100, 223 n. 37. It seems to me reasonable, therefore, to suggest that the Washington Coronation is close in date to the San Miniato altarpiece, dating to c. 1390 or shortly after. The Hon. William Keith Rous [1907-1983], Worstead House, Norfolk; (sale, Christie, Manson & Woods, London, 29 June 1934, no. 58, as by Orcagna); purchased by (Giuseppe Bellesi, London) for (Count Alessandro Contini-Bonacossi, Florence); sold October 1935 to the Samuel H. Kress Foundation, New York; gift 1939 to NGA. Bellesi worked in London as Contini-Bonacossi’s agent in the 1930s. The bill of sale for several paintings, including the Gaddi, is dated 10 October 1935 (copy in NGA curatorial files). The name of the British owner is incorrectly given as the Hon. Keith Bons. Masterpieces of Art. European Paintings and Sculpture from 1300-1800, New York World's Fair, 1939, no. 128. Arts of the Middle Ages: A Loan Exhibition, Museum of Fine Arts, Boston, 1940, no. 59. The pigments were analyzed using x-ray fluorescence spectrometry (XRF). The analysis was performed by the NGA scientific research department (see report dated February 13, 1988, in NGA conservation files). The gold decoration on the drapery is mordant gilded. See Fern Rusk Shapley, Catalogue of the Italian Paintings, 2 vols. (Washington, DC, 1979), 1:195, and several photographs in the NGA curatorial files, taken either during or after Modestini’s treatment. Photographs taken before the inpainting process [fig. 1] [fig. 1] Archival photograph, 1955, after cleaning but before inpainting, Agnolo Gaddi, The Coronation of the Virgin with Six Angels, c. 1390, tempera on panel, National Gallery of Art, Washington, Samuel H. Kress Collection show considerable damage along the right side join, obliterating the features of the second angel at this side and resulting in narrow losses along that join from the bottom edge to the elbow of Christ. There are also losses in the shoulder and nearer wing of the angel on the extreme right and small inpainted lacunae in the draperies and in the gold ground. The red lake pigments have faded significantly. The varnish is somewhat yellowed, and some of the inpainting has discolored. Christie, Manson, & Woods. Pictures and Drawings by Old Masters. London, 29 June 1934: no. 58. Ragghianti, Carlo Ludovico. "Su Agnolo Gaddi." Critica d’arte 2 (1937): 188, pl. 134, fig. 1. Valentiner, Wilhelm R., and Alfred M. Frankfurter. Masterpieces of Art. Exhibition at the New York World’s Fair, 1939. Official Souvenir Guide and Picture Book. New York, 1939: no. 8, pl. 6. National Gallery of Art. Book of Illustrations. Washington, 1941: 105 (repro. ), 240. Preliminary Catalogue of Paintings and Sculpture. National Gallery of Art, Washington, 1941: 70, no. 314. Book of Illustrations. National Gallery of Art, Washington, 1942: 246, repro. 107. Frankfurter, Alfred M. The Kress Collection in the National Gallery. New York, 1944: 18, repro. Paintings and Sculpture from the Kress Collection. National Gallery of Art, Washington, 1945 (reprinted 1947, 1949): 21, repro. Gronau, Hans Dietrich. "A Dispersed Florentine Altarpiece and its Possible Origin." Proporzioni 3 (1950): 42. Einstein, Lewis. Looking at Italian Pictures in the National Gallery of Art. Washington, 1951: 23 n. 1. Ferguson, George. Signs and Symbols in Christian Art. 2nd ed. New York, 1955: pl. 27. Paintings and Sculpture from the Samuel H. Kress Collection. National Gallery of Art, Washington, 1959: 23, repro. Berenson, Bernard. Italian Pictures of the Renaissance. Florentine School. 2 vols. London, 1963: 2:69, pl. 350. Shapley, Fern Rusk. Paintings from the Samuel H. Kress Collection: Italian Schools, XIII-XV Century. London, 1966: 39-40, fig. 98-99. Klesse, Brigitte. Seidenstoffe in der italienischen Malerei des 14. Jahrhunderts. Bern, 1967: 344. Boskovits, Miklós. "Some Early Works of Agnolo Gaddi." The Burlington Magazine 110 (1968): 210 n. 5. Fredericksen, Burton B., and Federico Zeri. Census of Pre-Nineteenth Century Italian Paintings in North American Public Collections. Cambridge, Mass., 1972: 77, 308, 645, 661. Boskovits, Miklós. Pittura fiorentina alla vigilia del Rinascimento, 1370-1400. Florence, 1975: 118, 303, 304, fig. 267. Cole, Bruce. Agnolo Gaddi. Oxford, 1977: 28-30, 35, 36, 89, 90, pls. 83-85. Boskovits, Miklós. "Review of Agnolo Gaddi by Bruce Cole." The Art Bulletin 60 (1978): 708, 709. Shapley, Fern Rusk. Catalogue of the Italian Paintings. National Gallery of Art. 2 vols. Washington, 1979: 1:194-195; 2:pl. 135. Cole, Bruce. Sienese Painting from Its Origins to the Fifteenth Century. New York, 1980: 14-16, fig. 8. Walker, John. National Gallery of Art, Washington. Rev. ed. New York, 1984: 73, no. 13, color repro. European Paintings: An Illustrated Catalogue. National Gallery of Art, Washington, 1985: 163, repro. Ford, Terrence, compiler and ed. Inventory of Music Iconography, no. 1. National Gallery of Art, Washington. New York 1986: 1, no. 4. Davies, Martin, and Dillian Gordon. National Gallery Catalogues. The Earlier Italian Schools. Rev. ed. London, 1988: 28. Eisenberg, Marvin. Lorenzo Monaco. Princeton, 1989: 56 n. 56. Kopper, Philip. America's National Gallery of Art: A Gift to the Nation. New York, 1991: 179, color repro. Petrocchi, Stefano. "Gaddi, Agnolo." In Enciclopedia dell’arte medievale. Edited by Istituto della Enciclopedia italiana. 12 vols. Rome, 1991-2002: 6(1995):426, 427. Skaug, Erling S. Punch Marks from Giotto to Fra Angelico: Attribution, Chronology, and Workshop Relationships in Tuscan Panel Painting with Particular Consideration to Florence, c. 1330-1430. 2 vols. Oslo, 1994: 1:262, 263; 2:punch chart 8.2. Gold Backs: 1250-1480. Exh. cat. Matthiesen Fine Art, London. Turin, 1996: 74, repro. 76. Ladis, Andrew. "Agnolo Gaddi." In The Dictionary of Art. Edited by Jane Turner. 34 vols. New York and London, 1996: 11:892. Rowlands, Eliot W. The Collections of the Nelson-Atkins Museum of Art: Italian Paintings, 1300-1800. Kansas City, MO, 1996: repro. 63. Frinta, Mojmír S. Punched Decoration on Late Medieval Panel and Miniature Painting. Prague, 1998: 132, 481. Splendeurs de la peinture italienne, 1250-1510. Exh. cat. Galerie G. Sarti. Paris, 2005: 62, 64, repro. 66. Boskovits, Miklós. Italian Paintings of the Thirteenth and Fourteenth Centuries. The Systematic Catalogue of the National Gallery of Art. Washington, 2016: 131-37, color repro. Frank L. Cross, ed., The Oxford Dictionary of the Christian Church (London and New York, 1958), 96–97. On the iconography of the Coronation of the Virgin in general, see Philippe Verdier, Le couronnement de la Vierge: Les origines et les premiers développements d’un thème iconographique (Montréal and Paris, 1980); Ulriche Liebl, “Krönung Mariens,” in Marienlexikon, ed. Remigius Bäumer and Leo Scheffczyk, 6 vols. (St. Ottilien, 1991), 3:680–683; and, especially as regards Italian painting, Richard Offner, A Critical and Historical Corpus of Florentine Painting: The Fourteenth Century, sec. 3, vol. 5, Bernardo Daddi and His Circle, ed. Miklós Boskovits, Ada Labriola, and Martina Ingendaay Rodio, new ed. (Florence, 2001), 531–539. Giovanni Previtali and Giovanna Ragionieri, Giotto e la sua bottega, ed. Alessandro Conti, 3rd ed. (Milan, 1993), pls. 114–115, fig. 354. According to Terence Ford, National Gallery of Art, Washington, Inventory of Music Iconography 1 (New York, 1986), 1, no. 4, the angels in the Gallery painting are playing a lute and a gittern, respectively. Bruce Cole, Agnolo Gaddi (Oxford, 1977), 90, wrote that the Gallery Coronation “may have originally had side wings, but this is by no means certain.” In fact, no panel of the Coronation of the Virgin that has the form and proportions of the one discussed here can be shown to have been a self-standing, single-panel painting. Miklós Boskovits, Pittura fiorentina alla vigilia del Rinascimento, 1370–1400 (Florence, 1975), 303. Erling S. Skaug, “Towards a Reconstruction of the Santa Maria degli Angeli Altarpiece of 1388: Agnolo Gaddi and Lorenzo Monaco?” Mitteilungen des Kunsthistorischen Institutes in Florenz 48 (2004): 245–257. Sonia Chiodo, “Gaddi, Agnolo,” in Allgemeines Künstlerlexikon: Die bildenden Künstler aller Zeiten und Völker, ed. Günter Meißner, 87 vols. (Munich, 2005), 47:113. See also Gaudenz Freuler, ed., Manifestatori delle cose miracolose: Arte italiana del ’300 e ’400 da collezioni in Svizzera e nel Liechtenstein (Einsiedeln, 1991), 202–203; and Laurence B. Kanter and John Marciari, Italian Paintings from the Richard L. Feigen Collection (New Haven, 2010), 26–28. For this panel, see Ada Labriola, in The Alana Collection, vol. 1, Italian Paintings from the 13th to 15th Century, ed. Mikós Boskovits (Florence, 2009), 8–11. Cf. Richard Fremantle, Florentine Gothic Painters from Giotto to Masaccio: A Guide to Painting in and near Florence, 1300 to 1450 (London, 1975), fig. 739. On the other hand, three saints appear to the sides of subjects other than the Coronation of the Virgin, as in the case of a triptych by Niccolò Gerini with the Crucifixion in the center, now in the Galleria dell’Accademia in Florence (no. 3152). Christie’s, Pictures and Drawings by Old Masters (London, June 29, 1934), no. 58; Carlo Ludovico Ragghianti, “Su Agnolo Gaddi,” Cri­tica d’arte 2 (1937): 185–189. Apart from the authors cited in the Bibliography, the attribution to Agnolo Gaddi was also confirmed in manuscript opinions by Bernard Berenson, Giuseppe Fiocco, Roberto Longhi, F. Mason Perkins, Wilhelm Suida, Raimond van Marle, and Adolfo Venturi. Fern Rusk Shapley, Catalogue of the Italian Paintings, 2 vols. (Washington, DC, 1979), 1:194–195, reported as the only dissenting voices the hypothesis of Hans Dietrich Gronau, “A Dispersed Florentine Altarpiece and Its Possible Origin,” Proporzioni 3 (1950): 42, in favor of an anonymous “companion of Agnolo,” and the one formulated by the present writer in the early days of his studies on Trecento painting, in 1964, and communicated to the Gallery (letter to Perry Cott, January 14, 1964, in NGA curatorial files). I had at that time proposed to unite the Washington Coronation with a group of paintings isolated by Roberto Salvini, but I have long since come to the conclusion that this group represents paintings belonging to the final phase of activity of Gaddi himself. Cf. Roberto Salvini, “Per la cronologia e per il catalogo di un discepolo di Agnolo Gaddi,” Bollettino d’arte 29 (1935–1936): 279–294; and Miklós Boskovits, Pittura fiorentina alla vigilia del Rinascimento, 1370 – ​1400 (Florence, 1975), 295–304. Cf. Fern Rusk Shapley, Catalogue of the Italian Paintings, 2 vols. (Washington, DC, 1979), 1:194–195. Cf. Miklós Boskovits, “Some Early Works of Agnolo Gaddi,” The Burlington Magazine 110 (1968): 210 n. 5; and Bruce Cole, Agnolo Gaddi (Oxford, 1977), 31. Erling S. Skaug, in Lorenzo Monaco: Dalla tradizione giottesca al Rinascimento, ed. Angelo Tartuferi and Daniela Parenti (Florence, 2006), 106–110; Erling S. Skaug, “Towards a Reconstruction of the Santa Maria degli Angeli Altarpiece of 1388: Agnolo Gaddi and Lorenzo Monaco?” Mitteilungen des Kunsthistorischen Institutes in Florenz 48 (2004): 245–257. Bruce Cole, Agnolo Gaddi (Oxford, 1977), 32 – ​39; Giuseppe Marchini, La Cappella del Sacro Cingolo nel Duomo di Prato (Prato, ); Marco Ciatti, “Gli affreschi della Cappella della Cintola,” in La Sacra Cintola nel Duomo di Prato (Prato, 1995), 163–223. Though he admitted the participation of assistants in some scenes, Bruce Cole, Agnolo Gaddi (Oxford, 1977), 39, was highly positive in his evaluation of the frescoes of the Cappella del Sacro Cingolo: “At Prato there is a harmony between fresco and frame, narrative and background, and figure and architecture. . . . The style of the Cappella​ . . . ​is, in a word, mature.” Yet the crowded compositions of the Sacro Cingolo frescoes often seem somewhat confused, and the individual passages, repetitive in kind and perfunctory in technique, rarely achieve in this cycle the quality of the frescoes in the cappella maggiore of Santa Croce, not to mention Gaddi’s most important panel paintings. Although the quality of execution is generally high, details like the foreshortened arms of the angels playing their instruments reveal some weaknesses in design. Bruce Cole, Agnolo Gaddi (Oxford, 1977), 16–17, 89, pl. 80, though he erroneously cited the painting among “Gaddi’s first recognizable works.” See also, following its recent restoration, Maria Matilde Simari, ed., La Croce di Agnolo Gaddi della Pieve di San Martino a Sesto Fiorentino (Florence, 1995). Miklós Boskovits, Pittura fiorentina alla vigilia del Rinascimento, 1370–1400 (Florence, 1975), 123–124; Bruce Cole, Agnolo Gaddi (Oxford, 1977), 51–56, 72, pls. 87–96; Angelo Tartuferi, “Le opere d’arte e la decorazione pittorica della chiesa,” in La Basilica di San Miniato al Monte a Firenze, ed. Francesco Gurrieri, Luciano Berti, and Claudio Leo­nardi (Florence, 1988), 1986. In contrast to most art historians, Cole did not believe that the documents of 1394–1396 referred to this work and considered it a product of Gaddi’s followers. On the neo-­Giottesque current in Florence that influenced many painters between the late fourteenth and early fifteenth century, cf. Miklós Boskovits, Pittura fiorentina alla vigilia del Rinascimento, 1370–1400 (Florence, 1975), 87–88, 100, 223 n. 37. Fern Rusk Shapley, Paintings from the Samuel H. Kress Collection: Italian Schools, XIII–XV Century (London, 1966), 40. A Cooper photograph (W. 8161) shows the state of the painting at the time of the 1934 auction. The rather rough retouching, evident especially in Christ’s tunic and in the profile of the second angel on the right side, proves that the panel had been restored sometime earlier, probably in the late nineteenth century. The pigments were analyzed using x-ray fluorescence spectrometry (XRF). The analysis was performed by the NGA scientific research department (see report dated February 13, 1988, in NGA conservation files). See Fern Rusk Shapley, Catalogue of the Italian Paintings, 2 vols. (Washington, DC, 1979), 1:195, and several photographs in the NGA curatorial files, taken either during or after Modestini’s treatment.